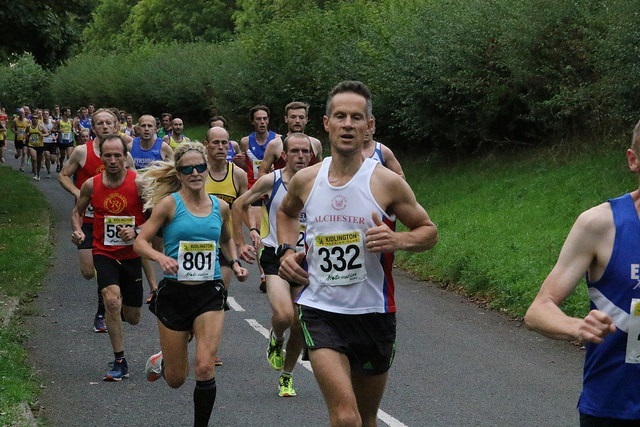 What could go wrong, another speed session off a positive race win on Sunday at Headington? Mainly my head, it wasn’t in race mode but I had committed to do the race. The weather also seemed to improve dramatically which meant a sticky evening of racing, on a positive I told myself its a warm-up, just over 4 miles. Wow, over 300 + runners locally with so many competitive clubs with handfuls of runners looking to get the team prizes and more importantly probably looking forward to the bar in the clubhouse. My hayfever started as I came out of the car due to the grass but very little I could do arriving without tablets. Like initially on Sunday my heart was at home and the head was saying I needed to do it. Having paid for the full series of 5 races I had only made two. ” Get a grip, warm up and get it over with !”. So that’s what I did, a crowded start with elbows everywhere, I knew Diane was likely to win being in good shape for the series and on the track. It took pressure off me and I also knew there were 100’s of ultra miles in my legs and my focus was on my championship. The course was similar to Headington 5 but a bit more windy and had to be careful on and off the pavement/underpasses and also the long cycle paths. Definitely felt more laboured than Sunday’s race but dug in deep and reminded myself in the big scheme of things it was ” training”. Knowing I was in second place I wanted to remain there and still see Di in my sights. Please with the 6.06 pace to take me into 2nd with a time of 24.27 for just over 4 miles. For the hard work, I ended up with a bottle of wine, not drinking Alex got the benefit of my hard graft. A great course and atmosphere to a race series, my goal will be next year to try and make them all rather than missing the early ones. Being Thursday evenings a lot depends on work and also being a morning runner I struggle with evening events and not running in the daytime. Last race done time to reduce the miles and focus on the big event GB Croatia 100k.